NHS Inform has some excellent advice and self-help tips for many health problems. In the first instance, it is worth you clicking on their logo and putting in the details of your symptoms or the condition you have or think you have – you will likely have your questions answered without even having to leave home! What can my local pharmacy do for me? Your local pharmacist can help you with many minor ailments, including coughs, colds, sore throats, sore ears and skin infections like impetigo and athlete’s foot. If you are a woman aged 16-65 and think you have a urine infection, the pharmacist can advise you and even give you antibiotics. If you have blood in your urine, contact the GP surgery instead. For more information visit the NHSGGC website pharmacy first page. For more information in general on services provided by pharmacies, visit the NHSGGC website pharmacist page. I have a problem with my foot. Podiatrists are foot specialists and can help you with all foot-related problems. They do not, however, provide a toenail-cutting service. Further information on their services is available on the NHSGGC website Podiatry page. My back or limbs are sore. Physiotherapists are highly-trained professionals who are certainly better than the average GP at diagnosing and managing soft tissue injuries (non fractures) to your neck, back and limbs. If you have hurt yourself in some way that is causing an achy muscle or joint, self referring to physiotherapy is probably the best option for you. You can complete a self-referral form which you can get from the physiotherapy reception desk in Eastwood Health and Care Centre (Barrhead Health and care Centre) or from your GP practice. For some NHS-sourced guidance on self managing many musculoskeletal conditions visit the NHS Inform website muscle, bone & joint page. I have an issue with my teeth or gums. Your dentist, also known as General Dental Practitioner, is the equivalent of your General Medical Practitioner (GP) for everything to do with your oral health. You should make sure you are registered with a dentist just as you are registered with a GP. Visiting your GP about a dental problem because you can’t get an appointment at your dentist or are not registered with one is NOT APPROPRIATE. Your dentist has trained for several years to be a specialist in oral health, your GP has only very basic training, and probably had that many moons ago! I have an eye problem. Optometrists are highly skilled allied health professionals who have undertaken several years of training focusing on eye health. Not only do they have skills and knowledge vastly in excess of a GP, they also have all the necessary equipment to thoroughly test all aspects of your eyes’ health. All optometrists in East Renfrewshire are signed up to provide same-day service if you have an urgent problem such as an acutely red or painful eye or loss of vision. Optometrists can diagnose and prescribe and can refer directly to ophthalmology (eye doctors), so there really is no need to ever see your GP about eye problems. If the optometrist identifies an eye problem which suggests a bigger health problem, they will inform your GP. Optometrists can see people of ALL ages, including children over 4 weeks old, about ALL eye problems. Depressed, anxious, stressed or lonely? Breathing Space is a voluntary organisation dealing with symptoms of stress, anxiety and depression. Contact them on 0800 83 85 87 or visit the breathing space website. RAMH (Recovery Across Mental Health) is a Scottish voluntary service with which we collaborate to provide services. You can visit the RAMH website to find out more. Bridges is the formal East Renfrewshire Primary Care Mental Health Team. Bridges trained staff to deliver short term psychological therapy and counselling to help you develop your coping skills and improve your mood. Treatment may take the form of group classes, workshops or 1:1 sessions. More details can be found on the East Renfrewshire website bridges page. Your GP can refer you, but you can also self-refer, cutting out the middle-man, by clicking on the East Renfrewshire website referral page. If you are a teenager or the parent of a child with mental health issues including depression, anxiety, drugs & alcohol abuse, eating disorders, sleep problems, bereavement or school-related issues, you can access a guide to various sources of help here. I have a problem with drugs or alcohol. If you think, or are being told, that you are drinking too much, or you are taking illicit drugs and want to stop, then you can contact our Community Addictions Team on 0141 577 4685. You can also visit the Talk to Frank website, If you’d prefer to get help out with the NHS framework. Sexual health, family planning and pregnancy. Glasgow has a service dedicated to sexual and reproductive health called the Sandyford Initiative. As well as their city centre headquarters, they run satellite clinics in various parts of the city, your local one is at Barrhead. You can call them on 0141 211 8130 (City) or 0141 800 7125 (Barrhead), or visit the Sandyford website. If you have done pregnancy tests and have discovered that you are pregnant, you can self-refer to maternity services by calling the centralised maternity booking service on 0141 232 4005. My GP & pharmacy are closed, what do I do? When your GP surgery is closed and the pharmacy is closed and you can’t wait until they open again, then you can call NHS 24 on 111. Also, there are a lot of self-help guides available on the NHS Inform website which will likely provide enough information to reassure and advise you how to self-manage your symptoms. I have cut, burnt or injured myself. The dedicated Minor Injuries Unit at the New Victoria Hospital is designed to deal exclusively with less serious injuries. This includes cuts, burns/scalds, sore limbs as a result of an accident. You can phone them on 0141 201 6000 if you are not sure if your attendance is appropriate. The MIU is open from 9am-9pm daily (out with these times, attend your local A&E unit) and sees everyone over 5 years old. If your child is 5 or younger, they should attend the Royal Hospital for Children A&E, based at the QEUH. Their telephone number, should you need it, is 0141 201 0000. The A&E in RAH Paisley also has a minor injuries area and is open 24/7. When should I call 999 or go to A&E? If you think you or your relative is suffering a serious, life-threatening condition such as a heart attack or a stroke, or you/they are struggling to breathe, it is appropriate for you to call 999 to speak to emergency services. If you have been badly injured e.g. obviously broken bone or profuse bleeding from a wound or a head injury in which you were knocked unconscious, it is appropriate for you to attend Accident and Emergency. How Can Technology Help My Health? The majority of practices in East Renfrewshire are now using the Telehealth/Florence system for diagnosing and monitoring high blood pressure, and we are constantly exploring new and innovative ways to use technology to improve the health of our patients. Children pick up viruses very frequently, especially during pre-school and primary school years. Most of the time they get better all by themselves if given enough time and care at home. To get some advice on what to expect in childhood illnesses and when you should be concerned and seek medical attention, please visit www.whenshouldiworry.com. They have produced an excellent booklet for parents which you can download by clicking here. If you are feeling unwell with your COPD or Asthma, such as more short of breath or wheezy than usual, or you have a cough and / or fever, it is appropriate to make contact with your GP practice for advice as you may need extra treatment such as antibiotics, steroids or a change to your inhalers. 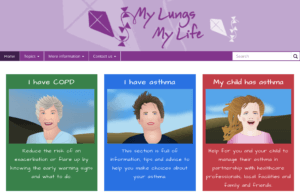 Click on the links in bold here for the NHS Inform guides to COPD and Asthma. One of the most common issues resulting in not feeling well with your COPD or Asthma is not taking your inhalers properly; here is the Greater Glasgow & Clyde guide to taking your inhalers properly. Are you trying to lose weight and are looking for some help with this? You can contact our Live Active programme on 0141 232 1860 or go to www.nhsggc.org.uk/getactive to get registered for a tailored exercise programme which includes mentoring, goal setting and supported activity sessions. In some circumstances you can also refer yourself to Glasgow and Clyde Weight Management Services. If you have Type 2 Diabetes and your Body Mass Index (BMI) is 25 or more (or 22.5 or more if you are of South Asian ethnicity) or if you have Type 1 Diabetes, Heart Disease or have had a Stroke and your BMI is 30 or more (27.5 or more for South Asians) you can self-refer. You can access their information leaflet at this address, available in multiple languages: https://www.nhsggc.org.uk/your-health/healthy-living/manage-your-weight/weight-management-service-information-leaflet/ or click here to download the English version. If you still haven’t had your questions answered or found a suitable alternative, then call your GP practice to arrange an appointment.